Yeah, I dropped Godmaster after unlocking the Pantheon of Hallownest. I feel bad, but I won't touch it unless it's required for the Hornet DLC, which would be a suicidal decision. It's kind of stunning just how much content there is in this game. I have over 50 hours and thought I'd been pretty thorough in cleaning up the map, but I missed several charms, The Collector, a Nail art, lots of grubs, the Mr Mushroom sidequest, and probably a bunch of other stuff I'm not remembering right now. And all of this is actual good content, well-made content too. Apologies for the double post but I just beat Radiance. It was pretty rough for like what, the first 2 hours, until I finally got her pattern down, and then fighting her actually became fun. I also beat Grimm but I kinda don't wanna fight Nightmare King Grimm right now. Maybe when the Hornet DLC drops I'll pop back in and finish it up, but I think I'm ready to move on now. What an amazing game. Nice! Well done. Yeah, I didn't end up fighting Nightmare King either - you can fight him in Godhome if you're so inclined, and I had no real attachment to either of the charms. If you've reached the village at the farthest west point (I think), you can head up and to the right - there's an exit high up from the village that leads to a stagway station. If you fell down into Deepnest due to the floor collapsing you should be able to climb back up the same way, slightly left of where you fell down. Alternatively, if you have the tram pass, you can head right from the hot spring and take the tram to Ancient Basin. Please don't post links without context; it's against forum rules. It is, but to be fair, that's really all the context there is. Looks like we'll be getting a first look for the Hornet DLC in a few days. So apparently they switched from dlc to fullblown sequel. Team Cherry is the team that just keeps delivering. We don't deserve Team Cherry. My god, I already can't wait. 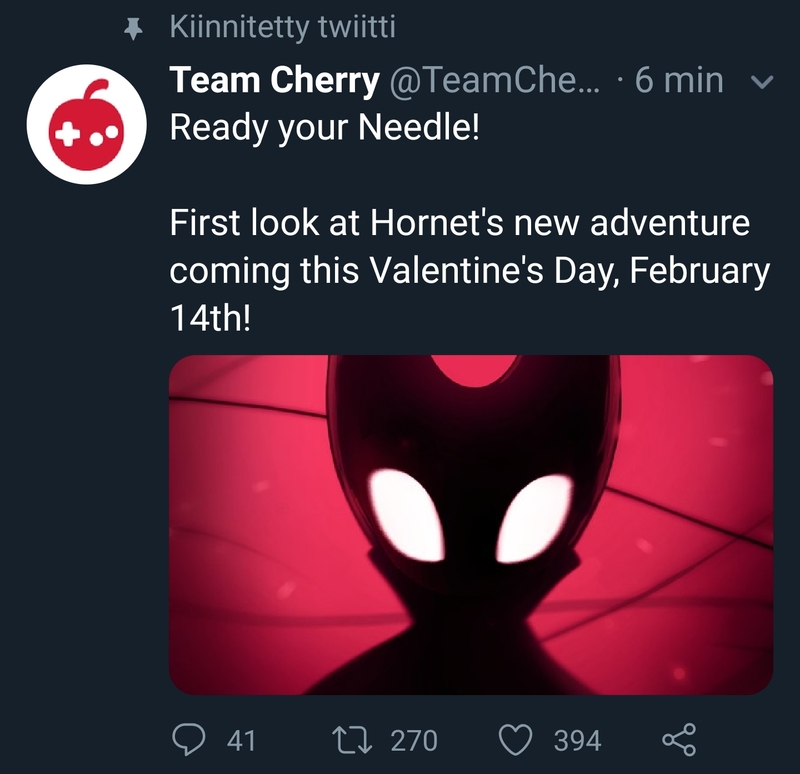 Team Cherry are just too good for this sinful game industry. Is it...is it still gonna be free, despite being a whole new thing? Or will it be a standalone? If I recall right, Hornet’s story was always gonna be a paid expansion, not free. This just means we get even more bang for our buck, so to speak. I'm pretty sure the Hornet stuff was always going to be paid content. No, I imagine it's going to be a full game. They may offer a discount or something? Based on what I'm seeing, it's a full new game. Total sequel. Same engine, new environment, starring our favorite secondary protagonist. Psh wake me up when we get to Zote the Mighty's game. I wonder if this game is going to take place after the new ending from Godmaster? That is something of a conundrum. By all means, the trailer doesn't suggest any relation to Godmaster's ending. The original intention, I believe, was to have Hornet DLC address that - but now that it's a whole new game happening in a new kingdom, I wonder if we'll get any flashbacks.